Thank you so much for supporting my blog! 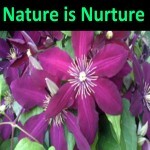 Your contribution is used to maintain Nature is Nurture on the web. I look forward to bringing you additional posts regarding my experiences with nature, especially those experiences in the plant arena. I hope you find them both educational and entertaining.